On January 24, 2017, Google announced some powerful enhancements for Chromebooks available for education, both for educators and students. These features (available in devices from Acer, Asus, HP, Dell, Lenovo, and Samsung) enhance the Chromebook’s versatility. With more than 20 million teachers and students employing Chromebooks, both will soon have access to devices that rely on “apps, stylus, and increased touch capabilities,” as well as USB-C charging (source). 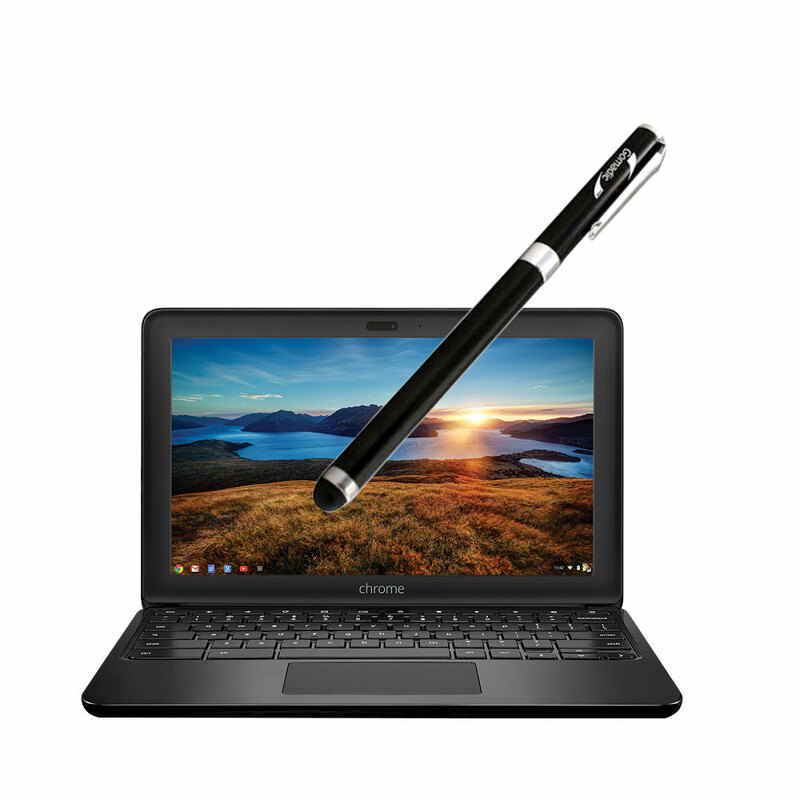 For teachers, Chromebooks will come with world-facing cameras. This enables teachers, as well as students, to capture videos and photos from all directions. Teachers will also have access to many Android apps, as well as specially designed cloud apps. These include Adobe Creative Cloud apps (such as Photoshop Mix, Lightroom Mobile, Illustrator Draw, Photoshop Sketch, Adobe Comp CC, and Creative Cloud Mobile). Teachers will be able to combine these intelligent enhancements with Chromebooks. They can use just-announced Google Classroom notifications for better assignment management and tracking with the new models. Explain Everything: An incredible, robust presentation, digital whiteboard app, and video annotation tool that is indispensable. 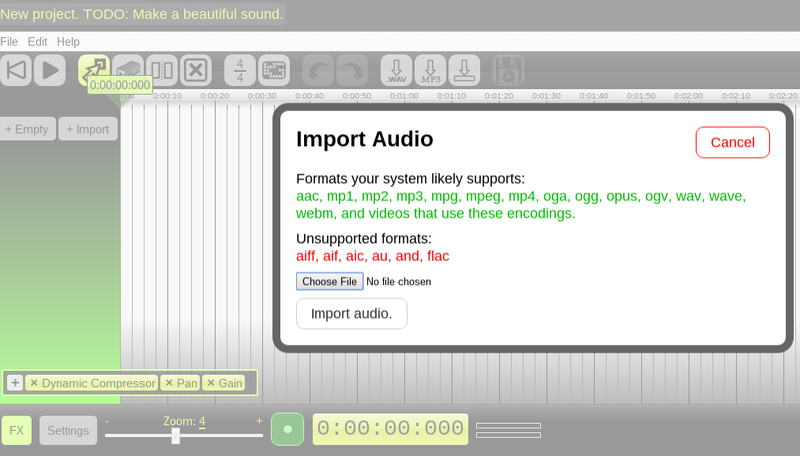 Soundtrap: This web-enabled audio editing and podcasting tool is a much needed addition for Chromebooks. WeVideo: A browser-based video editing solution that, like audio editing, remains in high demand in Chromebook environments. All these solutions are available at discounted pricing for schools. Even more exciting, especially in math and other classes where drawing is involved, students are able to take advantage of the inexpensive, high-quality stylus. This is an advantage when using the Google Classroom Android app. Styluses can be shared or easily replaced if lost since they do not require charging or pairing with a Chromebook. Thanks to Google for continually listening to educators about the needs of the Chromebook-powered classroom! I had a lot of fun making these flyers using Powerpoint. It was the first time I’d ever used Powerpoint to create flyers, believe it or not! 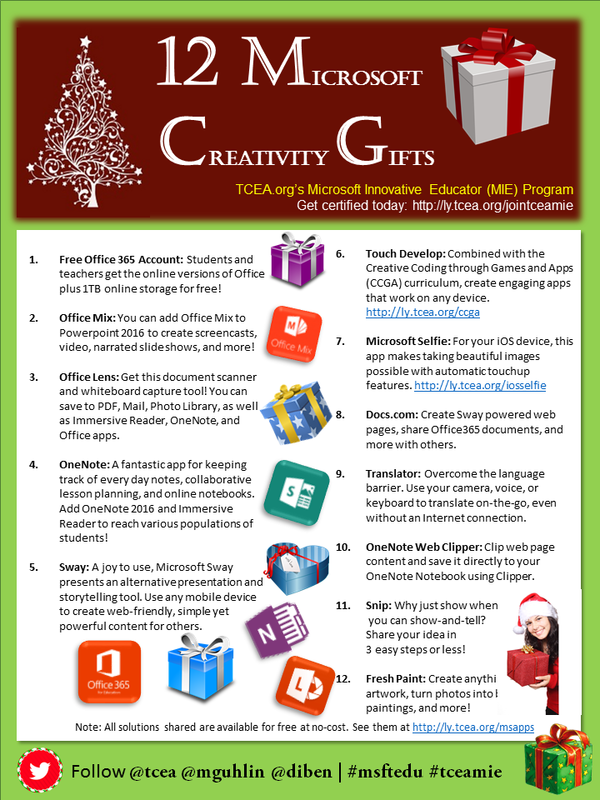 Note: These were published as a series of blog entries at TCEA.org Technotes Blog! TCEA.org is a non-profit education organization. Check it out at http://www.tcea.org/blog. In the interests of full disclosure, Miguel Guhlin serves as a Director of Professional Development; find out more about his work at http://ly.tcea.org/connect. While some report that 3D printing isn’t a thing anymore, it remains one of the top tech trends for the foreseeable future. That may be because 3D printers are finding their way into classrooms and homes with startling alacrity. This blog entry shares a few choices for printers, design tools, and sources, as well as mobile device apps. Wondering what printers you can get for your home? Consider these three offerings, ranging from least expensive to most expensive. The Dremel IdeaBuilder packs a punch to your wallet, but offers the most flexibility and versatility in its options. The Mod T also has adherents who praise its small size as perfect for your office desk. Whether you’re looking for a home printer, or considering a small 3D printer for the classroom, there’s something available to match your budget. Looking for 3D Printing Designs and Tools? Tinkercad – A wonderfully easy to use, web-based 3D printing tool. SketchUp Pro – This $695 program for Mac and Windows computers is available at NO CHARGE to K-12 public schools! 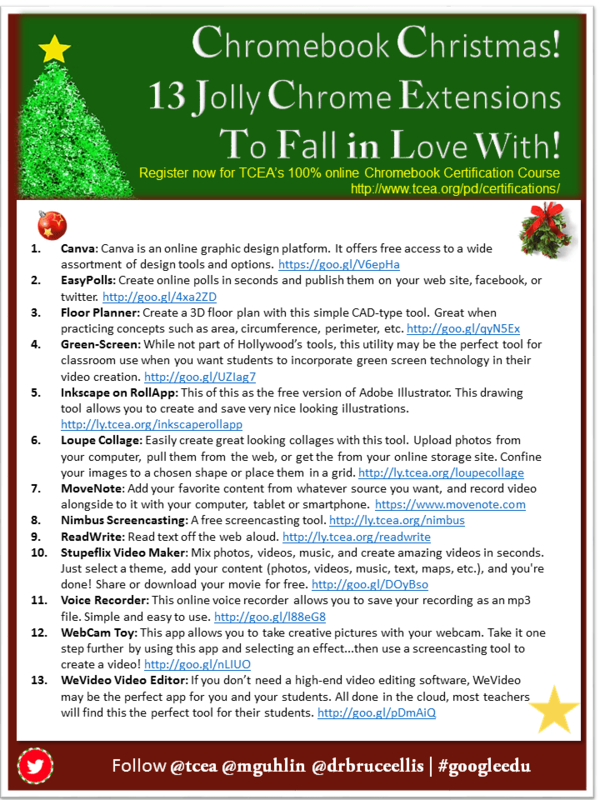 Click the link to find out more about TCEA’s offer. My SketchUp – This browser-based version works great on Chromebooks and is available at no charge. Never worry about breaking glass ornaments again with 3D filament-based tree decorations. These curios are easy to design, modify, and print for home and office. More importantly, they make it easy to print take-home designs for students. Find more designs online with these apps at Thingiverse using their iOS app (free) , and 3D Warehouse using SketchUp Viewer for iOS ($14.99). Office Lens: Get this document scanner and whiteboard capture tool! You can save to PDF, Mail, Photo Library, as well as Immersive Reader, OneNote, and Office apps. Get it via your mobile device in the iOS App store, Google Play Store, or Windows Store. Translator: Overcome the language barrier. Use your camera, voice, or keyboard to translate on-the-go, even without an Internet connection. Get it in the iOS, Android or Windows Store. Fresh Paint: Create anything–original artwork, turn photos into beautiful paintings, and more! Get it in the Windows Store. 3.Makedo Cardboard Kit : Use Makedo to make magical cardboard creations! Find out more at https://www.make.do Also explore digital origami tools! 4.BeeBot : Model coding with the BeeBot floor robot. Check out available curriculum! Note: This blog entry originally published at TCEA’s TechNotes blog. “Figure out which toys your friends can play with,” I remember my Mom saying to me before a sleepover with classmates. “And put the ones you don’t want to see damaged, lost, or stolen away.” It’s advice that I took to heart and shared with my own children before they had friends over. Here’s some advice you may want to consider before deploying Chromebooks in schools…or, consider leaving your “best practices” in the comments. Best Practice #1 – Establish procedures before issuing Chromebooks. How will students be issued Chromebooks? How should students be advised to transport Chromebooks? What happens when there is a substitute teacher in the room? Will students be permitted to take advantage of the Chromebook? What should be done when a Chromebook suffers damage? No food or drinks should be in sight when Chromebooks are out. Carry Chromebooks with two hands at all times. Do not get a Chromebook if teacher is out of the room. Nothing should be on the desk except the Chromebook unless told otherwise. Students should only be on websites assigned or approved by teacher. Have students and parents sign a statement saying they will abide by the rules. Have reasonable consequences for students who aren’t following the rules (taking away the Chromebook should be your last resort). As you might imagine, some common-sense suggestions include assigning a student to be in charge of the Chromebooks, ensuring monitoring of issuance and receipt of devices by class members. Also, consider including a Google Form to let students report how a Chromebook was damaged. Another point to consider is to be sure to label your class Chromebooks so they will be easy to locate in case they leave your classroom. Finally, Kim from Fairfield ISD suggests that the teacher and students get in the habit of plugging in Chromebooks correctly so they are charged for the next group. Best Practice #2 – Teach Chromebook basics along with digital citizenship. “You can’t issue students devices until they’ve had digital citizenship lessons required by eRate.” And, of course, digital citizenship lessons also ensure that you can discuss important issues about caring for other people’s equipment. In my experience, students often take great care of equipment issued to them when there is a culture of care cultivated in the school as a whole. Keys aren’t ripped off keyboards in classrooms where the teacher makes every effort to care for his/her technology and assigns students the jobs of cable management, removing dust from devices, and cleaning keyboards/screens. Yet every device brings its own challenges, and Chromebooks are no different. Providing an overview of Chromebook and Google Apps tips ensure that students feel confident in using new technologies, rather than frustrated. Best Practice #3 – Promote collaboration. “My two favorite tools for a 1-to-1 classroom,” I shared at the recent Tots and Technology Conferences that took place in Galveston and Frisco this past summer, “include Nearpod.com and Seesaw.com.” Each of these provides critical tools that you need as a teacher to share your screen and presentations with students, as well as collect their work. Nearpod serves as a presentation and eyeball management tool for you, pushing your screen out to all student Chromebooks. Seesaw serves as a digital portfolio that collects students’ digital and physical work in one virtual space that is easily shared but manageable. Note: Scan the QR code shown right using the Seesaw app on your device of choice to get Seesaw Plus for free for 30 days! Quiz tools: Other ways to engage students include quizzing tools like Quizizz.com and Kahoot.com. Quizizz allows students to login with their Google account, and all completed assignments are reported and available in Google Classroom. Easy video assessment: Use tools like EdPuzzle and/or FlipGrid to take already existing videos from YouTube, Khan Academy, etc. or put your own online, then add your voice and questions to create an interactive video lesson. You’ll be able to see how many times your students watch your interactive video lessons, how many times they attempt a question, and the responses given. Share web links with Google Tones: Facilitate the sharing of complex uniform resource locators (URLs) using Google Tone. Take screenshots or record video screencasts: Use tools like the Nimbus Screenshot/Screencast extension for Google Chrome to quickly capture your screen for a flipped lesson or explanation. Use Google Classroom to create a virtual classroom presence for students, blending in Google Calendar and YouTube videos to facilitate online learning. Use badges in your classroom: TCEA member Joe Camacho (@CamachoEdTech) recommends setting up and issuing badges to celebrate student learning and sharing. Students can learn Google Apps tools such as Sites, Classroom, Forms, Docs, Drawings, and Slides, as well as other tools in use like DocHub, Flubaroo, Edpuzzle, Kahoot, Quizizz, creating screencasts, and Padlet. Another neat tip for promoting collaboration and sharing comes from Erin Laughlin again. She suggests creating a “shark tank” in your classroom, having older students create products that are evaluated by younger students serving as “the sharks.” Older students pitch their solution to a problem using Google Hangouts, bridging the distance between their classroom at one campus and another. Of course, this activity can also be done at even greater distances. If that is of interest, consider the Connecting for a Cause website, where students create a Google Sites web presence that represents their cause. Google’s announcement that the Google Play Store with its Android apps will be available to some models of Chromebooks may be a game changer for education. 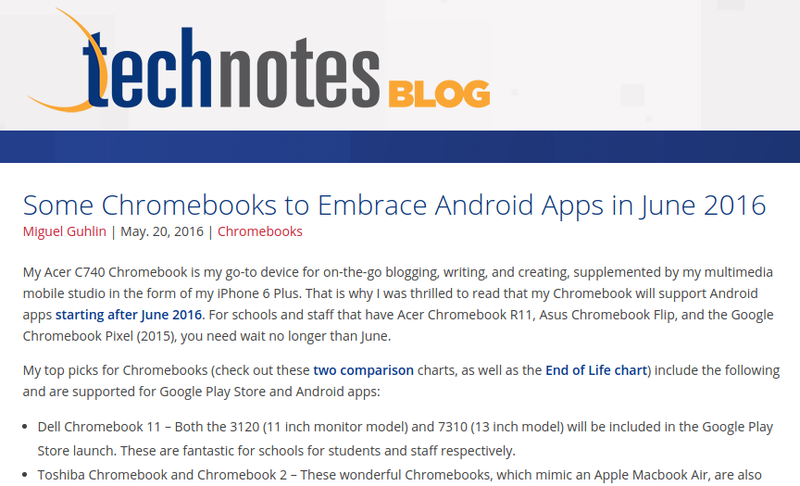 Read the rest of this blog entry online at TCEA’s TechNotes blog. Ever had to do any audio editing on a Chromebook? I have, and the only client out there that worked well (like Audacity) costs TOO MUCH money. I won’t even mention the client since it is darn expensive and I have no doubt that many folks paid a lot for it…just a twisted pricing model! Ok, that aside, what if you could edit audio files on a Chromebook at low-cost, or even better, no cost if you’re a school district or educational institution? What about if that solution could save straight to GoogleDrive? Interested? If you’re looking for something like that, then be sure to check out the Beautiful Audio Editor–which allows you to export MP3 audio for one-time fee of $3.18 (pay attention, ONE time fee). Earlier today, I recorded audio from a presentation at TCEA TECSIG–with the presenters’ support and permission–on my iPhone using Voice Record Pro, but didn’t have an easy way to make some edits to the file (ok, Voice Record Pro has built-in audio editing but I didn’t want to try to do it on my iPhone with Voice Record Pro or Hokusai). Problem: How to edit pre-recorded audio on my Chromebook? Note: This process ultimately failed with a 51 minute file but I retain high hopes for Beautiful Audio Editor. Step 3 is where it all went wrong!! Again, I think it’s the SIZE of the audio file. I was successful with smaller audio files. Before exporting the recorded file from Voice Record Pro, I converted it to MP3…a nice feature in Voice Record Pro! After doing this, I saved the file to my Chromebook. Once that was done, I was able to listen to the audio and make adjustments (edit/cut) content, not unlike Audacity on a desktop/laptop computer. Note that I did pay $3.18 to get the MP3 export feature, but it looks like WAV export format is available at no cost…and you could just convert that WAV file with web-based tools like Media.io or Online-Convert.com. As you might imagine, I had high hopes that I would be able to save my 51 minute audio recording of collegial coaching presentation, but alas, it was not meant to be. This process DID work with smaller files, though. Of course, I had hoped this solution would work perfectly. It did not FOR LARGE AUDIO files, but it did for short stuff (which may make it appropriate for Chromebook Education users!). As you can see, I was instructed to download the audioproject file but was unable to do so successfully, receiving the error Failed-No File. 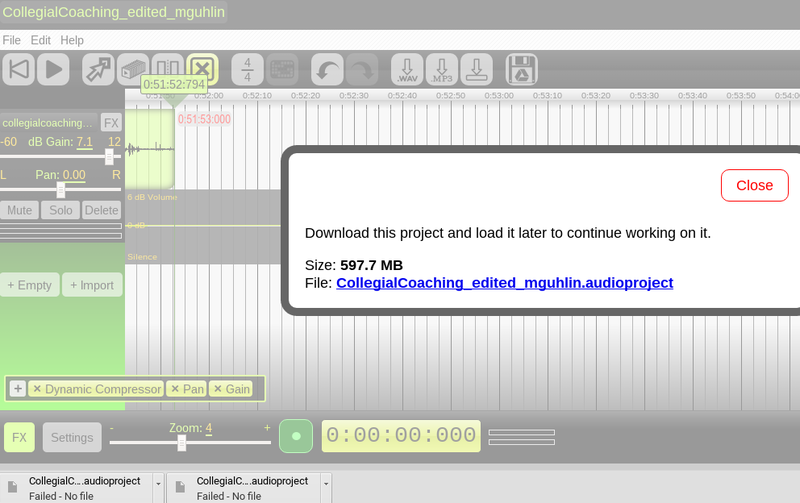 CollegialCoaching_edited_mguhlin.audioprojectThe server could not find the file. One second, the .WAV button appears, but the next (after clicking it), the button disappears! Hmm…the same thing happened with the MP3 file, too. So, SAVE to Google Drive failed as well. This left me with 51 minute audio-edited file with no way to save it!! As you can see, file generated is zero bytes long…so, no data. I’m looking forward to the Beautiful Audio Editor folks fixing this! 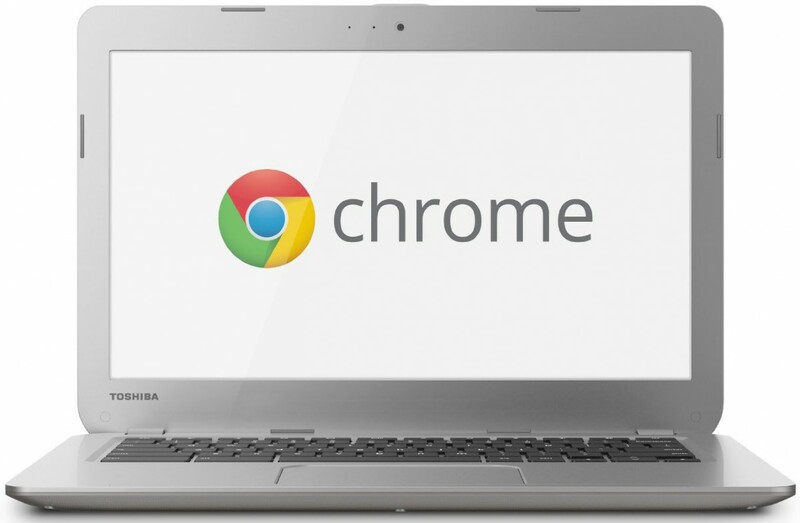 “You know,” shared a colleague going to Gabon, “I love Chromebook! 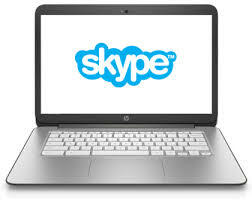 I probably would have gotten a Chromebook if I could Skype on it! But I did get a good deal on my under $700 Lenovo laptop!” Ah, what a difference a few months makes. Now, Skype works on Chromebooks! Using an Acer C720 Chromebook, I was able to easily follow the instructions outlined in this MakeUseOf.com article entitled, How to Install Skype on a Chromebook. (lots of screenshots there!). Leave the unzipped files in your Downloads folder. 2) Turn on Developer Mode by going to the 3 horizontal bars in the top right corner of the screen then choosing MoreTools–>Extensions. 3) While still in Developer Mode, click on Load unpacked extension, choosing both the ARChon unzipped file (which will have a funky folder name unzipped), and the Skype unzipped file. 4) Go to Apps and select Skype to start it up. We believe that putting a Chromebook in the hands of every HS student will have a substantial impact. Having technology at home extends the learning environment beyond the walls of the classroom. Presentation is adapted from one done at the State Capitol lately. This has been a dream for a long time. Successful plans are built in the right order with the right people. Implementation Plan: 1 to 1 starting at 9th grade. Prior to that, 2 to 1 cart solution of Chromebooks. Prior to that, we did some training. student and staff training: spent 2 days, paid subs for high school teacher and TCEA did the initial training. The 2nd day, staff received a chromebook and developed a small project. By 2017 every HS student will have a Chromebook. Kids are going to take that device they received at 9th year. When they earn 11.5 credits, they can take the device home in the summer. MiFi available for student checkout (Verizon). It’s attached to the MAC address of the Chromebook and GOGuardian is being used on Chromebooks. Parents must attend information meeting. $31 insurance fee for Chromebook…students had sponsors. Chromebooks will be checked in over the summer break. When students graduate, they will take their Chromebooks with them. If there is a loss or theft the student must report this to the THS Tech Help Center Immediately. Review of Securly vs GoGuardian.